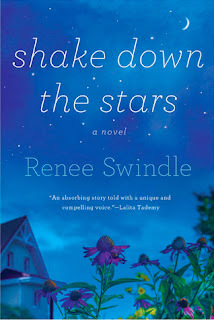 Please welcome Renee Swindle, author of Shake Down the Stars, as she braves our Desert Island Interview. Would she survive? Her first novel, Please Please Please, was published by the Dial Press/Dell. Please Please Please was also published in Germany as Mehr Mehr Mehr and published in Japan. Please Please Please was an Essence Magazine bestseller. Renee Swindle earned her BA from UC Irvine and MFA in creative writing from San Diego State University. She lives in Oakland, California with her two dogs and three cats–meow! Renee Swindle Stranded on a Desert Island! War and Peace. I’ve never read it before and I figure as long as I’ll be on that island, I’m going to need a nice long book. My bed. I plan to build a cabin and would like to have my bed shipped in. I would definitely enjoy the solitude. I’m an introvert who meditates. I can take it! Just one? Hmmm… The Dalai Lama. I’m a tea-aholic so I’d miss tea. I think I could last three months. Give my dogs big hugs. Say goodbye to the Dalai Lama. Desert Island: not so bad! 5 STAR review from Novel Escapes! Piper Nelson is stuck. She can’t quite stay away from the husband she divorced. She isn't always attentive to the high school students she teaches. And even she admits that she’s been drinking too much and seeking out unsuitable men. Piper’s mother, married to a celebrity evangelist, and her sister, immersed in plans to wed a professional football player and star in a reality TV show, are both too self-absorbed to sympathize with Piper’s angst. They tell her to get a grip. But how can Piper ever really recover from the blow she suffered five years ago, when a car accident took the life of her young daughter? When Piper's ex-husband announces his new girlfriend is pregnant, Piper is forced to take stock. Realizing that it’s time for a change is one step, but actually making it happen is quite another. And despite what she thinks, Piper can’t do it alone Lucky for her, a couple of crazy, funny new friends are ready to step in when she needs them most…and show her how to live and laugh again.